Apple Vs. The FBI: The Unanswered Questions And Unsettled Issues : All Tech Considered The FBI isn't saying if it can reuse its mystery digital crowbar to unlock other iPhones. The standoff is likely to be replayed as new technologies become a growing element of criminal investigations. 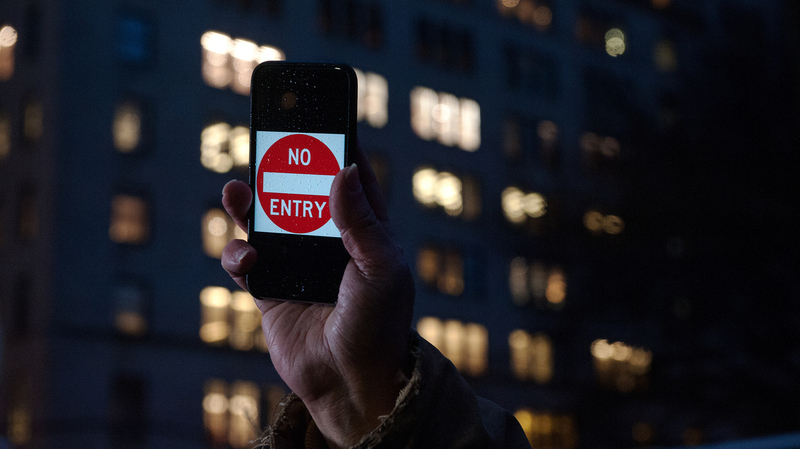 A protester supporting Apple in its battle against the FBI holds up an iPhone that reads "No Entry" outside an Apple store in New York on Feb. 23. The FBI's success in unlocking, without Apple's help, the iPhone of one of the San Bernardino terrorists marks a dramatic end to the heated dispute between the Justice Department and the tech giant about the scope of the government's power to compel a company to weaken its digital security for a criminal investigation. Below are some of the key takeaways — and mysteries — left in the aftermath of the case. What has been settled? The particular case of this specific phone, though we don't know yet what exactly the investigators found inside. (A quick recap) Because the information on the iPhone used by Syed Rizwan Farook was encrypted and uncrackable, the investigators needed to guess the passcode that locked the phone's contents. The FBI wanted to hook it up to a computer that would figure out the four-digit combination, but the phone's security features required manual password attempts and would have wiped the phone clean after 10 wrong tries. So the FBI got a court order compelling Apple to write special software that would lift those security features, which Apple fought. After weeks of saying that Apple's special software was the only way to safely get inside the phone (read here why the NSA wasn't an option), the Justice Department last week said a third party had proposed a new, undisclosed method — and on Monday, the method was proved successful. If unlocking this particular iPhone was the goal, "you could argue that this is a success because the FBI got the information much more quickly than they would have through the court system," says Eric Berg, a lawyer at Foley & Lardner and former federal prosecutor who specialized in electronic surveillance. But was this iPhone's content the entire goal? The case sets no precedent and another similar dispute is likely. For years, these kinds of government requests were settled behind closed doors. The standoff over the San Bernardino shooter's iPhone escalated the debate over law enforcement's ability to force cooperation from an unwilling third party. One of the major stakes in this standoff between Apple and the FBI was the ability of the government to force cooperation from an unwilling third party. The government's court order against Apple relied on a broad 18th century law called the All Writs Act, which has been used to compel assistance from other companies, but the scuttling of the legal case against Apple leaves no case law for how All Writs can be used to bypass digital security. That means this dispute is likely to be replayed, with Apple or another maker of encrypted devices — or encrypted messaging — as new technologies become a growing element of criminal investigations. "Unfortunately, this news appears to be just a delay of an inevitable fight over whether the FBI can force Apple to undermine the security of its own products," Alex Abdo, staff lawyer at the American Civil Liberties Union, said in a statement on Monday. "It remains a priority for the government to ensure that law enforcement can obtain crucial digital information to protect national security and public safety, either with cooperation from relevant parties, or through the court system when cooperation fails. We will continue to pursue all available options for this mission, including seeking the cooperation of manufacturers and relying upon the creativity of both the public and private sectors." Can the FBI now get into all iPhones? It depends on what method it used, which we may never find out. We don't know the details of what method the FBI used to get inside this locked iPhone, and the government may try to keep it classified. "There's not really any requirement for disclosure because they're not involving Apple," says Berg, the former federal prosecutor. Apple says the FBI has not shared its technique with the company either, and its lawyers have previously said they'd push for such a disclosure. Whether the technique can be applied to the hundreds of other locked Apple devices seized in other criminal investigations around the country depends on what exactly it entails. According to iPhone forensics researcher Jonathan Zdziarski, if the method relied on tinkering with the hardware inside the phone (like the memory chip cloning method we described here), that could be reused on other older devices, like the iPhone 5C at the center of this dispute. But if the method exploits a weakness in the phone's software, Zdziarski says the technique could work on newer devices. If investigators do want to reapply this tool to other traditional investigations, they will need a search warrant with probable cause. NPR business intern Naomi LaChance contributed to this story.